Sixty Minute Men is made up of musicians from all walks and from all around the country. This brethren of musicians has come together with a common interest to create genuine original music. The Sixty Minute Men sound is a blend purposefully designed to have your feet moving and booty shaking with lyrics that anyone can relate to regardless of your background. Blending styles from classic funk, soul, R&B, blues, rock, and disco, Sixty Minute Men always have something fresh up their sleeve; constantly evolving and improving as a result of their dedication to musicianship and genuine reflection of who they are as a group. Check out the "Tour" page to see what's up next, and stay tuned for the NEW album drop coming soon! Sonny Cruz was born in New Jersey into a military family and lived in many different areas of the United States. This gave Sonny a great appreciation for various different American cultures and the for the music of the various regions in which he lived. Sonny began his musical journey watching Uncles, Cousins, and Grandparents performing music and also, by singing in the church choir. He studied Percussion throughout school and also sang with many school choirs and ensembles. Immediately after graduation, he started studying under Dr. L. Scott Martin of Julliard, subsequently receiving a certificate of achievement under Dr. Martin through the Academy Of The Arts. Soon after, Sonny traveled the country playing music anywhere and everywhere he could, ultimately moving to Colorado to live with family and to use his experience in the emerging Colorado Music scene. Finding minimal success with a few different Colorado groups, Sonny answered an ad to audition with the Sixty Minute Men and they joined forces to record and tour. Sonny claims his main influences to be James Brown, Rick James, Steve Perry and Michael McDonald. Self-taught guitarist, Zach was born May 28th, 1988 in Huntington, New York. From early on, Zach had a strong affinity towards music of all kinds, and it wasn’t long before he discovered he had a unique and intense passion for the guitar. Playing with several groups on Long Island as well as in Colorado, he has polished his individual style over the course of 16 years. Zach has guided his personal form with help from a plethora of influences, some of which include: Jimmy Page, Mark Knopfler, David Gilmour, John Frusciante, and Eric Clapton. Robinson prides himself on his ability to conform to a vast variety of musical styles and genres, his favorites being Rock, R&B, Reggae, Funk, and the Blues. Andrew Fox was born in Athens, Ohio where he began his musical education early on. Grounded with 17 years of experience, Fox studied the electric and upright bass at both Ohio University and Jorma Kaukonen’s Fur Peace Ranch, an education that provided him with a vast understanding of the multitude of genres and styles of music. Fox then used his musical education in tandem with a strong desire to find other musicians who shared his passion in order to begin performing for anyone who’d listen. Fox initially performed all across Ohio, both in the studio and on the road, with several groups in Athens, Columbus, Cincinnati, and Cleveland. His desire to deepen his musical experiences brought him to Boulder, where he experimented with a few bands before finding his place in The Sixty Minute Men. His major influences include Jaco Pastorious, Les Claypool, John Entwistle, and Jack Casady. Born in the summer of '83 , Nick grew up in the cozy southern town of Ruston, Louisiana. Musically inclined from a young age, Summers was influenced by the sounds of New Orleans, an eclectic blend of swamp rock, funk, jazz, and the blues. Nick remained in Louisiana through high school and college, with music being a constant throughout the years. Summers moved to Austin, Texas shortly after college to join with nationally touring artist Papa Mali. He played with various other groups in Austin before moving to Boulder, Colorado to further his musical career. After experimenting with different bands, he then found his place in what would become the Sixty Minute Men. Nick Summers is an official Bosphorus Cymbals endorsed artist. Born in New York City, Jonathan was raised on jazz, blues, classic soul, and R&B. Taking an interest in music from an early age, he began his musical training at age 11. Inspired to learn saxophone by iconic cartoon characters Lisa Simpson and Bleeding Gums Murphy, it quickly became a passion that he has fervently pursued ever since. 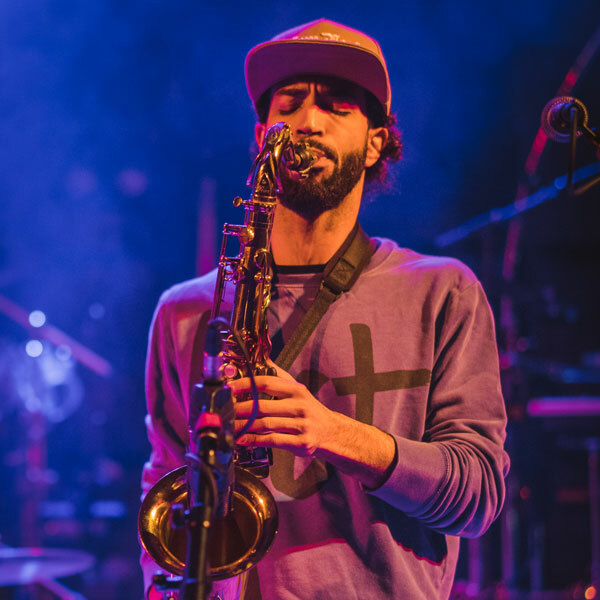 After playing in roughly 30 ensembles while working toward completing his Jazz and African American Music Studies degree from the University of Massachusetts Amherst and spending two years learning pro audio and producing, he joined the Sixty Minute Men shortly after moving to Boulder in January 2015. As a University of Massachusetts graduate, joining the Minute Men almost felt like destiny. He has had the pleasure of tracking and mixing their most recent albums and looks forward to finishing the upcoming album in 2018.